Floyd Arthur Butler, age 86, of Kendallville, died Monday, October 29, 2018 at home. Mr. Butler was born February 1, 1932 in Kendallville, Indiana to the late Wesley and Elsie H. (Weimer) Butler. He graduated from Avilla High School in 1950 and volunteered to serve his country in the United States Coast Guard from 1951-1954 during the Korean War. He married Sharon Lois Rahrig on May 25, 1957 at the Zion Evangelical Lutheran Church in Garrett, Indiana. 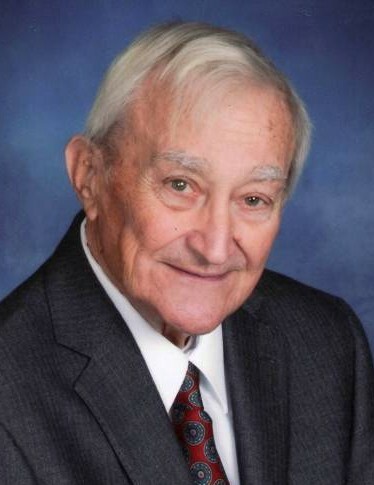 Floyd was employed with Northern Indiana Fuel & Light Company in Kendallville for 40 years before retiring in 1995 as Vice President of Operations. He was a lifetime member of St. John Lutheran Church and member of the American Legion Post 86 both of Kendallville. Floyd was a devoted and loving husband and father. He was a dedicated family man and a very active grandpa attending all of his grandchildren’s events over many years. He enjoyed camping with his family at Myrtle Beach and Folly Beach in South Carolina. He loved attending reunions with his wonderful shipmates and friends from the Coast Guard ship “Chambers”. Floyd was also a die-hard Detroit Tigers fan. Wife, Sharon Butler of Kendallville. Son, Jeff and Kathlene Butler of Kendallville. Son, Scott and Carla Butler of Kendallville. Daughter, Nancy and Joe Taylor of Kendallville. 7 grandchildren: Brittany and Aaron Meyer of Dickinson, North Dakota; Ben and Kelcie Taylor of Avilla; Sam Taylor of Indianapolis; Kyle Butler of Indianapolis; Damon Butler of Kendallville; Lauren Butler of Denver, Colorado; and Megan Butler of Kendallville. Great granddaughter, Lyric Alyse Meyer. He was preceded in death by two sisters, Bernice Burgi and Lucille Mertz. Visitation will be Friday, November 2, 2018 from 2:00 – 7:00 PM at Hite Funeral Home, Kendallville. Funeral services will be held on Saturday, November 3, 2018 at 11:00 AM at St. John Lutheran Church, Kendallville with Pastor Phil Rigdon officiating. There will be an hour of visitation before the funeral service at the church. Burial with military honors will take place at Lake View Cemetery. Pallbearers will be Ben Taylor, Sam Taylor, Kyle Butler, Damon Butler, Aaron Meyer, and Grey Fox. Memorial donations may be made to St. John Lutheran Church or School.